It's Still Center City District Restaurant Week! You still have a few days left! Until September 23, participating restaurants offer three-course dinners for only $35 and three-course lunches for $20. Get the full list, menus and reservations at CenterCityPhila.org/restaurantweek. There's also still time to enter the contest for 52 gift certificates from Center City restaurants. While enjoying Restaurant Week, you can also enter our Instagram contest! Post your fav CCDRW photo (food, group dining, etc.) with the hashtags #CCDRW and #TreatMeTD. Win a $50 dining gift card and a $100 TD Bank VISA gift card. Presented by: TD Bank, OpenTable, Canadian Club Rye, Effen Blood Orange, Toki Japanese Whisky or Suntory Whisky Toki, Century 21, The Sterling, and the PHL CVB. Partners include: Visit Philadelphia, Philadelphia Parking Authority, and the Philadelphia Parking Association. 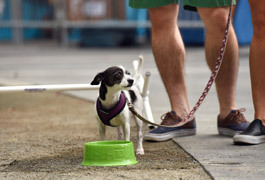 On September 21 and 28, bring your four-legged friend to Yappy Hours presented by TD Bank at Dilworth Park! From 5-7pm, come to the southern end of the park for CCD Sips-priced cocktails. Post a photo to Instagram of your dog at Yappy Hours tagged #YappyHours and #DilworthPark and you could win prizes! Partners: Zoom Room, Whole Animal Gym, Pennsylvania Society for the Prevention of Cruelty to Animals, Philadelphia Animal Welfare Society, Morris Animal Refuge, Red Paw Emergency Relief Team and Dilworth Park Café. 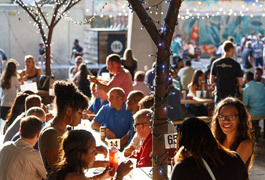 There's still time to enjoy Center City District Sips! It continues 5-7pm, September 21 and 28, with $5 cocktails featuring 2 Gingers, $4 wine, $3 beer and half-priced appetizers all over Center City! Get the full list bars and their specials at CCDSips.com. Sponsored by 2 Gingers and American Express. On September 22, The Free Library marks the eve of what would have been author F. Scott Fitzgerald’s 120th Birthday with a whole day of programs: a lunchtime literary salon, The Great Gatsby film screening, a birthday toast, a behind-the-scenes talk with producers from Gatz, and a panel on the life and legacy of Fitzgerald featuring Maureen Corrigan, Jackson Bryer, and more. Reading Terminal Market is partnering with Molly Malloy's and Pearl's Oyster Bar to bring you this year's OysterFest! On September 23, 7-9pm, sample a dozen different varieties of raw oysters (including Cape Shore Salt oysters, Cape May Salt oysters, Sweet Amalia oysters, and Forty North oysters) alongside a dozen craft beers from local breweries such as Evil Genius, Philadelphia Brewing Co., and Yards. Net proceeds will benefit Reading Terminal Market's programming for the Strawberry Mansion Learning Center. For information and tickets, click here. On September 28, 11:30am-2:30pm, the rotunda of The Shops at Liberty Place will host the Drexel Medicine Fall Health Fair. Come for free health screenings (blood pressure, vision, skin cancer) and talk with Drexel Medicine and Hahnemann Hospital doctors and staff. Learn more about cancer awareness, heart health, healthy eating, dermatology, diabetes, eye care, gynecology, physical therapy, sleep medicine, stroke, women’s and men’s health and much more.